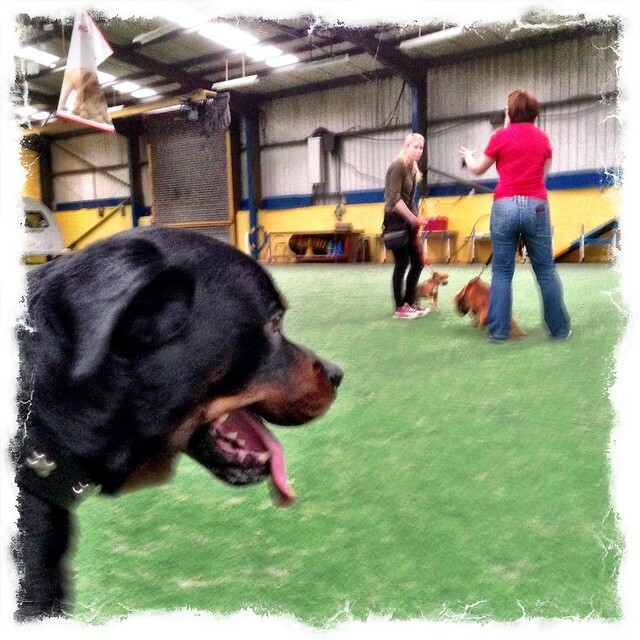 Last Tuesday we headed to StrayAid in Coxhoe, County Durham with the idea of getting another dog. We had looked on the StrayAid website the day before and spotted a Rottweiler named Hero, and also a couple of Lurchers that took our fancy. Laura and I had been talking about adding another member to our family for quite a while, and now the time felt right. We were certain we would love to have another dog in the house, and thought Barley our rescue Lurcher would also like a playmate. At StrayAid we took Porter (Hero) for a short walk on the grounds, and then introduced him to Barley. Barley was a bit growly with Porter initially, but nothing too excessive. I think he was just showing him who’s the Boss. For Laura and I, Porter was a perfect fit. We both like larger dogs, our first dog together was a Great Dane, and we wanted a dog that was a similar or larger size than Barley. Barley may be slender, as is typical of sighthounds, but he is extremely well-muscled and incredibly strong. As the meeting between Porter and Barley went fairly well, and Laura and I instantly loved him, we decided to adopt Porter. The adoption process involved filling in several forms, while we chatted to the lovely staff who work at StrayAid, about Porter, pet insurance, vaccinations etc. Paperwork complete, it wasn’t too long before we were all back in the car, and our family of four headed home. 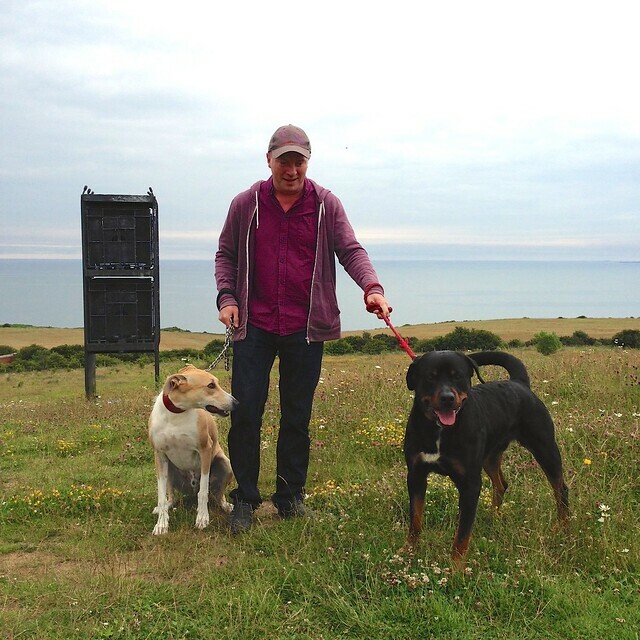 Once we arrived home in Easington Colliery with Porter, we took both of our boys for a walk. We didn’t go too far because Porter was still recovering from being neutered, but he enjoyed a short walk sniffing out his new area. Back at home we showed Porter around his new home, he seemed happy with it. For the next few days we let Porter settle in gently, and get familiar with his new surroundings, both at home and out in the local World. 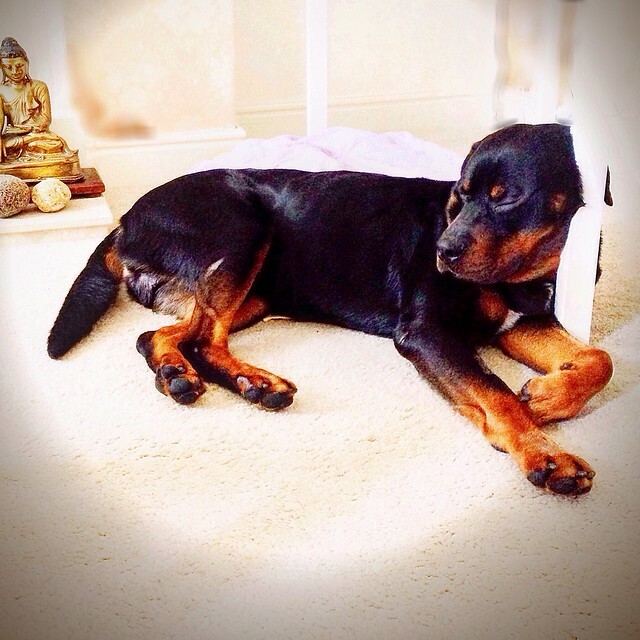 Once Porter was more settled in his new routine at home, the next step was to take him to ‘puppy training’ and dog socialisation classes at DogHouse (Plateau 9, Cold Heseldon, Seaham, Co Durham SR7 8ST. TEL:0191 523 6666). We took Barley to DogHouse just after we’d adopted him, and it was great for him and us. 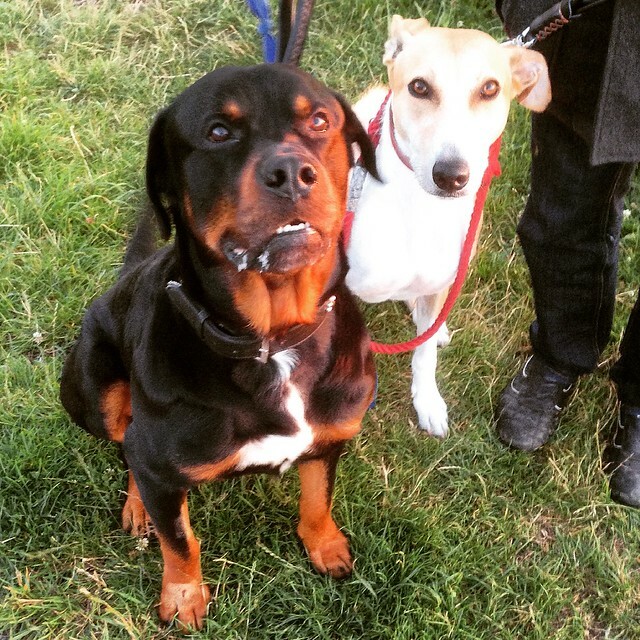 Keith, the guy who runs the dog obedience classes has a great way with both dogs and people, and he must have a photographic memory as he always remembers the names of all the dog and their owners. Porters first time at DogHouse was not without incident. He took a fancy to a small Dachshund, which was very yappy and jumping around all over the place. Porter was very focused on the little dog. So mush so, he managed to slip out of his collar and make a beeline for the Dachshund. No blood was spilt though, and Keith and I managed to get Porter back under control. Phew! Hopefully the next few weeks at DogHouse will help me and Porter with our obedience, and there will be no further off-lead incidence. Porter is very under weight, and he has muscle wastage, so unfortunately he can only cope with short walks at the moment. We are giving him lots of good healthy fresh food and slowly putting weight on him, and building up his muscles. Porter also has pressure sores, so we are guessing he has spent a lot of time confined to a kennel or yard. 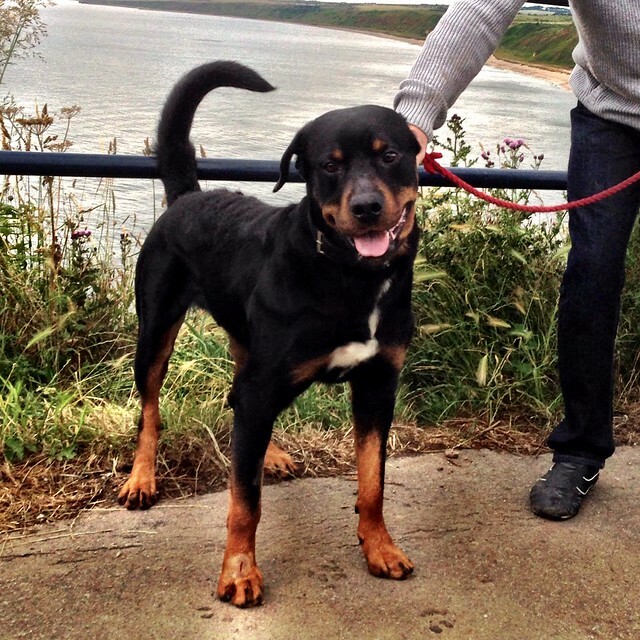 Hopefully with time, he’ll stabilise at a decent weight, his muscles will be as they should be, he’ll be able to enjoy lots of beach running with Barley, and he’ll be the happiest and healthiest Rottweiler in County Durham. 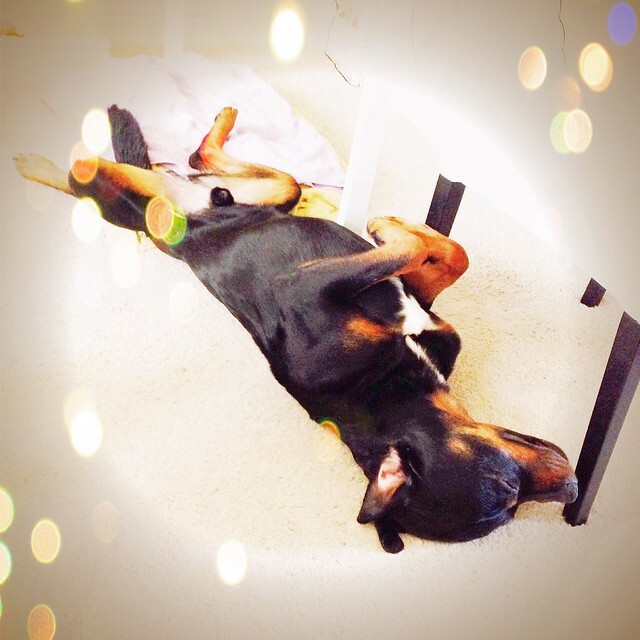 As you can see from the photos above and below, Porter has settled in nicely. We think he likes it here! Photo Disclaimer: The photos in this blog post are not great quality because they where taken on an iPhone, and in low light conditions. Once Porter is more relaxed, we will introduce him to the DSLR. 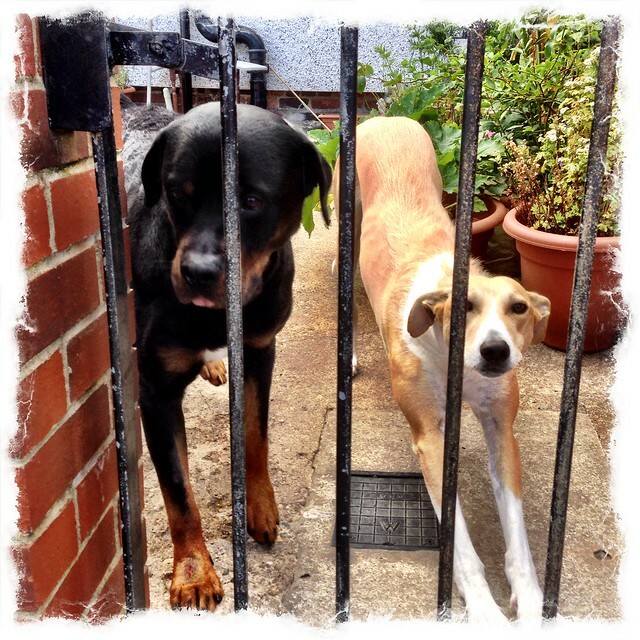 This entry was posted in Barley the Lurcher, Porter the Rottweiler and tagged Rottweiler on July 22, 2015 by Richard.